Bonds are a bit of an enigma here. Yesterday they moved in the exact opposite direction one would expect for a rise in equities, and it was a very large move. This, too, is a disconnect and I’m wondering why I’m seeing these now? Again, something needs to get in synch, gee, I wonder what it’s going to be? Both oil and gold are down this morning. Yesterday was a big day for both gold and silver. There is a rising expanding megaphone in gold, it overthrew the top yesterday, but is now well back inside, it is visible on the 30 and 60 minute time frames. This is a short term pattern, probably indicating a short term pull back is near. That pattern, when broken to the downside will usually return to its base, or about the $1,080 level which is a key support level for gold. 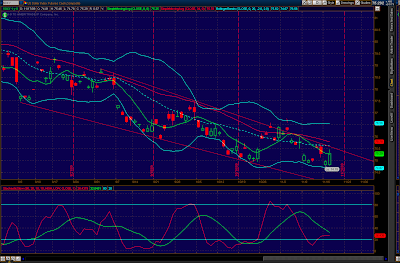 Again, if it does pull back, it is probably a smaller wave within a larger wave up. As I did my evening studying last night, I felt a sense of elation from nearly everyone with yesterday’s new highs. While I don’t see that in the put/call ratios, the VIX did make what could be a hammer bottom yesterday, that would need to be confirmed by the VIX moving higher today. Yes, all of the sudden being bearish is “idiotic” and “it’s the price, stupid” seem to be the themes. Most who talk that way, of course, are not the professionals, in fact, more and more professionals are coming out on the bearish side. People talking that way, though, tells me that indeed a top is getting very near. Yesterday, the DOW closed right up against the upper boundary of the rising wedge AND up against the far boundary of the bear market downtrend line which is very close to a 50% retrace of the entire bear market. That makes this location pretty stiff resistance for the DOW. The Transports made a new closing high yesterday, and that has the DOW Theory people shouting that the secondary trend is now bullish again, reconfirming the primary bullish trend. I personally don’t buy that interpretation, while the closing position is most important, I don’t interpret DOW Theory until BOTH the closing and intraday high or low has been exceeded. 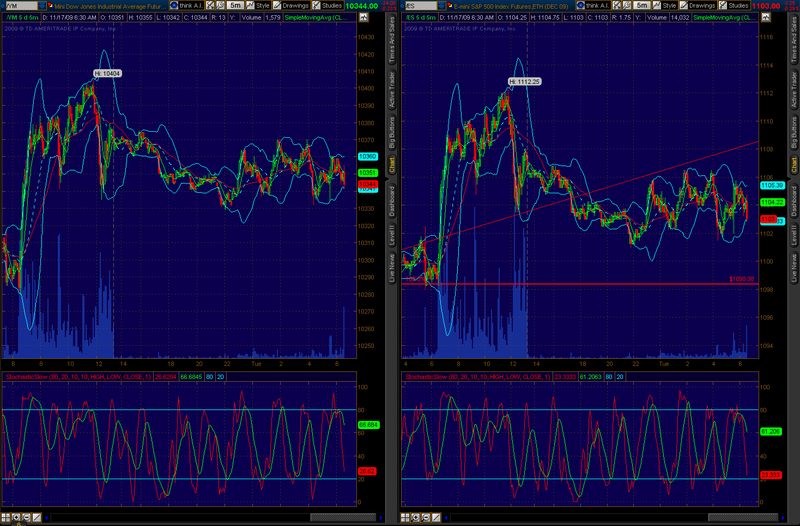 It has yet to exceed that intraday high. The Goldman ICSC and Redbook both show roughly 2% yoy gains in sales that are disconnected from sales tax data and again I have no respect for either of these statistics. The ICSC shows -.1% week to week. Higher oil prices boosted the headline PPI but the big story is a sharp decline in the core PPI. The overall PPI increased 0.3 percent in October after dropping 0.6 percent the month before. The rebound in October lower than the consensus forecast for a 0.5 percent boost. The increase in the latest month was led a 1.6 percent boost in energy and a 1.6 percent rise also for food. But at the core level, the PPI rate unexpectedly dropped 0.6, following a 0.1 percent dip in September. The market had expected a 0.1 percent gain for September. The fall at the core level was due mainly to declines in prices for light trucks and passenger cars. The Bureau of Labor Statistics indicated that the core would have been up 0.1 percent in October. Turning to some component detail, the October rise in energy prices was led by gasoline which rose 1.9 percent after declining 5.4 percent the month before. The core rate was pulled down primarily by 5.2 percent drop in light truck prices and a 0.5 percent decline in prices for passenger cars. For the overall PPI, the year-on-year rate rose to minus 1.9 percent from minus 4.7 percent in August (seasonally adjusted). The core rate year-ago pace eased to up 0.7 percent from up 1.8 percent the prior month. On a not seasonally adjusted basis, the year-ago decrease for the headline PPI was 1.9 percent while the core was up 0.7 percent. While finished goods prices were soft at the core level, inflation pressures firmed at earlier stages of production. In October, prices received by manufacturers of intermediate goods moved up 0.3 percent and the crude goods index increased 5.4 percent. Overall, inflation pressures are mixed with end demand keeping most prices soft for core finished goods but food, energy and commodities are maintaining upward pressures. Treasury yields eased just after release of today's report. 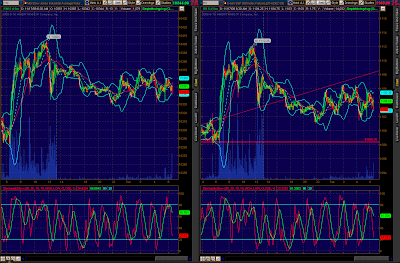 I am really seeing the ying and yang of this market in that report. It’s a tug-of-war between speculative hot money and the forces of deflation. Take away that hot money, and deflation will definitely reassert herself. That’s because our economy is based almost entirely on paper fluff. The cleansing forces of deflation have not done their job, the vast majority of work is still ahead in most areas. In October, the industrial sector remained in recovery mode, but slipped to a slower pace. Manufacturing actually edged down. Overall industrial production in October edged up 0.1 percent, following a revised 0.6 percent increase the prior month. October's gain came in below the market forecast for a 0.4 percent rise. However, the manufacturing component declined 0.1 percent, following a revised 0.8 percent jump in September. In the latest month, utilities output rebounded 1.6 percent while mining output dipped 0.2 percent. Within manufacturing, durables fell 0.4 percent after jumping 1.1 percent in September. Motor vehicles and parts slipped 1.7 percent in October after an 8.1 percent boost the prior month. Nondurables advanced 0.2 percent in the latest month, following a 0.7 percent increase in September. Compared to recent months, the change in auto output had a modest effect on the broad aggregates. By special category, overall production excluding motor vehicles was up 0.4 percent for October while manufacturing ex-motor vehicles was down 0.1 percent. Overall capacity utilization in October continued its rise from the historical set in June, posting a gain to 70.7 percent from 70.5 percent in September. The October number matched the consensus forecast. On a year-on-year basis, industrial production in October slipped to minus 7.1 percent from down 6.0 percent the month before. 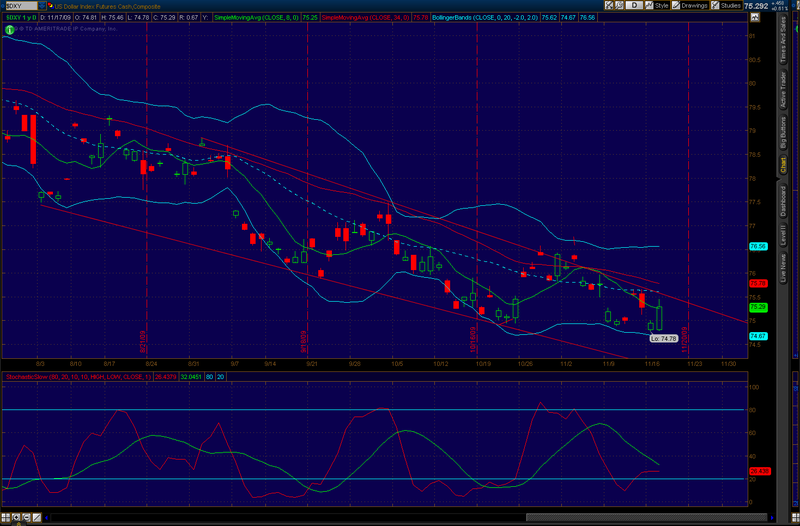 Basically, the recovery continues but likely with a choppy trend. While there is much news yet to come, the initial numbers for the fourth quarter suggest a slower growth rate than in the third quarter. Again, note the still very large year over year negative numbers and a utilization rate that, while off the bottom, is near historic lows. 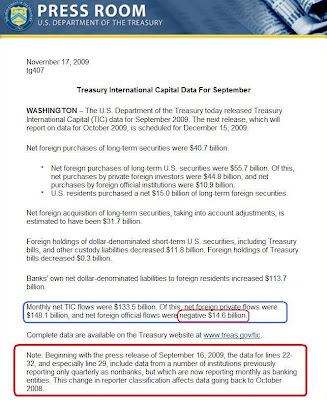 Now let’s talk about the TIC data (Treasury International Capital)… The Treasury has stopped putting their press release that contains the chart in .pdf form. This month the HTML table is completely blurred. While I can retrieve individual country data, I do not trust that data entirely as it does not jive with other reports. Foreign demand for U.S. financial assets remains light but is up in the latest data. Net foreign purchases of U.S. long-term securities rose a respectable $40.7 billion in September. Domestic securities purchased by foreigners rose a net $55.7 billion, offset by $15.0 billion in net foreign securities purchased by U.S. residents. Private purchases, at a net $44.8 billion, were up from the prior two months, while official purchases, at a net $10.9 billion, were a little lower. U.S. equities are in demand, with foreign purchases up a net $15.7 billion. Demand for long-term Treasuries was also very strong, up a net $44.4 billion. China, which is voicing concern over the decline in the dollar, is not increasing its holdings of U.S. Treasuries which are steady at $798.9 billion, still little changed since May. Holdings in Japan have been on the rise, up more than $20 billion in September to $751.5 billion. China and Japan -- are by far -- the two largest holders of U.S. Treasuries. The decline in the dollar has not helped demand for U.S. financial assets where foreign inflows, before last year's credit collapse, would often exceed $100 billion. Below is the verbiage contained within the release along with their note on changes. I guess when we see the revised data for the previous reports we can compare data to see how large the effect is, but I have not seen the past revisions yet. 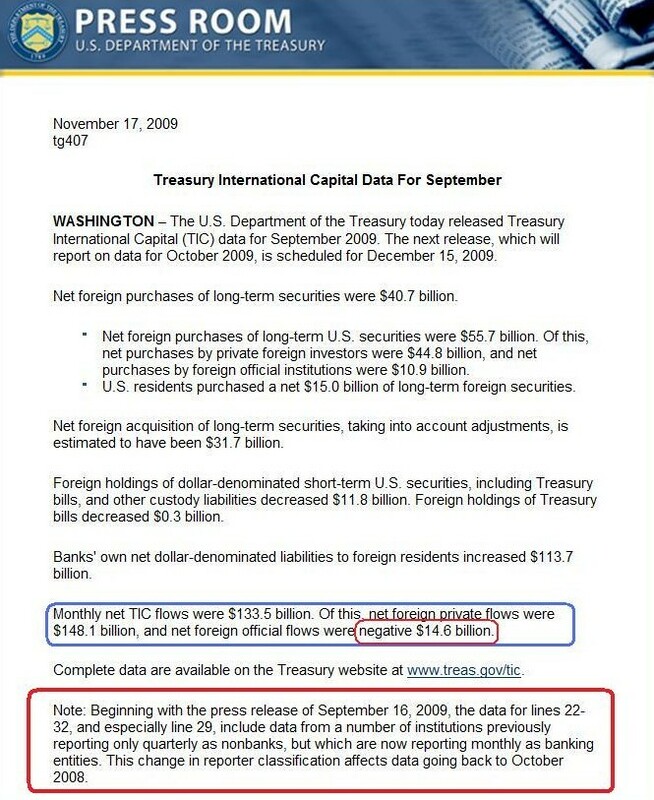 The table in this report is too blurry to read, here is a link to the report – October TIC Data.